The use of pouches for medical devices and implantable packaging is growing. Much of this growth can be attributed to pouch strength, puncture resistance, and barrier protection. Pouches will be the container of choice for medical devices and supplies. We carry a variety of sealers which are ideally suited for the medical and pharmaceutical industry. If you do not see what you are looking for please contact us for further information. Our newest addition to our band sealer family is the HRS-255 rotary band sealer. Our newest addition to our band sealer family is the HRS-255 rotary band sealer. This sealer is ideal for sealing paper-plastic packages such as tyvek, foil, or other hermetic materials typically used for packaging medical instruments or disposable devices such as IV bags, suture kits, medical draping, bandages, gauge and other sterile products. D-3010HCA is an impulse sealer designed specifically for sealing sterile bag and tubing. The 10mm wide sealing seam provides the best protection and prevents bacteria from penetrating into sterile packs. The sealing and cooling time can be preset with the digital control panel to guarantee consistent and safe sealing. The sealer is also equipped with a cutting device and roll dispenser to make and cut pouches easily. The D-3010HCA sealer is also equipped with a counting timer. Design is compact to suit any medical, dental, veterinary, or laboratory with a limited amount of space. Our UHSS-8 seals up to 3,500 tubes per day! Ideal for laboratories, research facilities, R&D, and quality control groups. Unit is economical, safe and very easy to use. The tube sealers can be used on all polyethylene, and laminated tubes. Sealers are equipped with a stainless steel shelf with height gauges to allow for easy changeover of various height tubes. Included is a custom tray made for your tubes (sample tube required for fabrication). Remember: When you order, please also send a sample tube if you want a custom tray fabricated for your tube. Retractable Nozzle vacuum sealers are the most versatile among the three types of vacuum sealers we carry. Ideal for vacuum/gas flush packaging. This type of vacuum sealer requires a compressor to operate, but some sealers are internally equipped for the convenience of the user. We carry vacuum sealers with sealing widths from 11″ to 50″ to cover a variety of applications. Many options such as stainless steel, double sealing jaws, single or double retractable nozzles, analog or digital controls, pneumatic or built in air compressor are available to suit the needs of the operator. Sealer Sales has a network of over 100 distributors in North America and we would like to highlight Stapler Warehouse which has quite the expertise in our heat sealers. Stapler Warehouse is a specialty retailer providing a wide variety of industrial, commercial and office equipment/supplies. It is one of the top retailer suppliers of industrial staples, packaging equipment, carton closing tools & other high quality products from leading manufacturers at competitive prices. Stapler Warehouse’s product selection is supported by an easy to use website, providing helpful product information & expert sales and customer service. Not sure what you are looking for? Give Stapler Warehouse a call and they will walk you through which heat sealer will work best for your application. Stapler Warehouse carries our full line of our W-Series Auto Sealers from our 12″ automatic sealer to our special order 35″ – 59″ seal length automatic sealers. Stapler Warehouse all carries our continuous band sealers from our smaller versatile CBS-880 to our larger FRM-1120LD band sealer. The goal of our industry highlight blogs is to provide actionable ideas with current trends that start up customers can use to make packaging decisions. Our first industry highlight blog post will focus on the meat snacks industry which is now a $1.5 billion industry in the United States according to market research firm IRI. The growth rate for jerky products is second only to popcorn. As Sealer Sales is a One Stop Shop of Sealing Equipment & Supplies, we can help with both the pouches and heat sealers for jerky packaging. While the industry is dominated by Jack Link’s with more than 50% of the market, the above trend factors are resulting in large growth rates for brands that offer a new value proposition for consumers – i.e. gourmet or premium brands. For example, premium brand Krave was purchased by Hershey Co. in 2015 and Hershey expects its 2017 outlook to be positive partly from the growth in sales from Krave. We can offer both flexible packaging as well as heat sealing equipment. Barrier bags are absolutely essential for packaging jerky to prevent oxidation and spoilage. Our best barrier stock bag is our EVOH bag which was manufactured for products that require an extended shelf life. The bag is equipped with a hang hole and resealable zipper. In addition, there is a window which allows the customer a sneak peak of the products. Other stock bag options include: clear vacuum bags with hang hole and zipper, our clear/gold and clear/black vacuum bags, foil stand up pouches, metallized flat pouches. For companies just starting out, we suggest choosing a bag from our stock option program and placing a label on the bag. We can work on quotes for custom bag specifications or suggest really great manufacturers to work with, but there will be minimum quantities (estimate approximately 20,000pcs to start). If you do want to go the custom route, please fill out the attached survey. Once the pouch has been selected, the pouches must then be filled with your product and heat sealed to prevent the bags from being tampered with. To seal your jerky pouches, we offer a variety of heat sealing equipment that can meet your needs. Whether you are just starting your production and looking for basic and affordable units or faster production volumes with the option to print a date code or expiration date on the seal line, we can help recommend a heat sealer. We also carry vacuum sealers which will completely remove oxygen from your bags preserving your jerky product. Our most basic and least expensive sealer is our hand sealer – if you are looking to do to seal about 15 packages per minute, we would suggest this option. Otherwise, our band sealers will be our most efficient method for sealing plastic bags. Band sealers operate via conveyor. The operator would feed his or her bag into the machine and release. The band sealer will then take the bag via conveyor through the sealing process. Some of our band sealers are equipped with printers so you are able to print a lot code or expiration date on them. Operator would just have to feed the bag so the process is much less tiring than a hand sealer. Here is a video demo of how our band sealer operates. Kooee Snacks, a premium brand focusing on 100% grass fed beef combines their jerky with trail mix. The company uses our FRS-1120W band sealer in order to seal and date code their bags. Do you have a jerky product that needs assistance with packaging options? If so please contact us and we would be glad to assist you. If you already have your bags and need a heat sealer option, we can test your bags on our band sealers and send the samples back to you along with a video demo. Just contact us! Come visit us at the Natural Products Expo West from March 10-12 at the Anaheim Convention Center! Revere Flexpak will be at Booth #5158 to answer any questions about your packaging projects. On display will be the CBS-880 band sealer which is an ideal easy to operate sealer for sealing stand up pouches. Industry leader of stock and flexible packaging and labels. Our job is to make your products look great. With in-house prepress, plate making and multiple presses, we manage the production process from start to finish. Different products have different needs, from oxygen or moisture barriers to UV light protection. Our decades of experience ensure you get the packaging solution you need. Sustainable 100% LED printing & facility. Roll film – convert to bags, pouches, bar & bottle wraps. 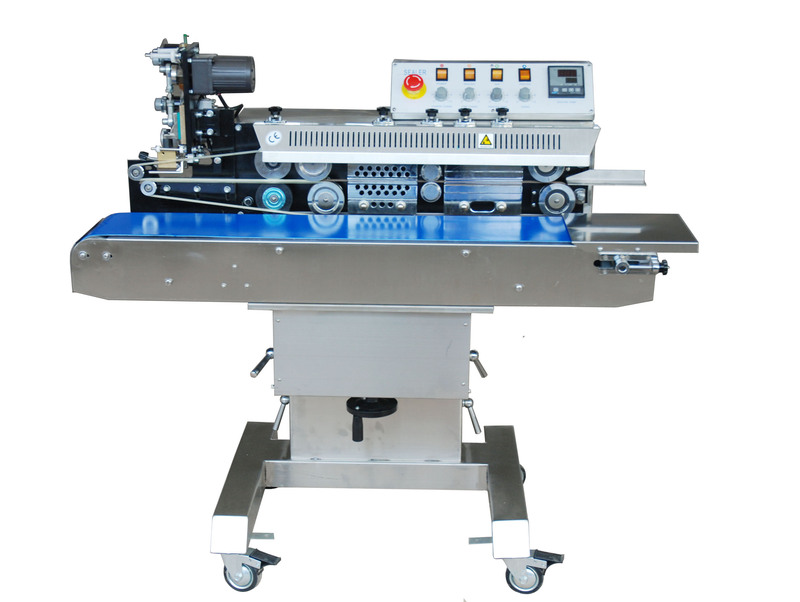 While we stock many different models of heat sealers, we know that the need arises for some custom machines. Kernel Season’s approached us about a band sealer with a wide seal. Our stock band sealers offer 8mm (.31″), 15mm (.59″), or 20mm (.78″) seal widths but Kernel Season’s wanted a wider seal. Working with Kernel Season’s request, we were able to special manufacture a band sealer with a 30mm (1.18″) seal width. This width is perfect for bags with a hang hole as the band sealer will seal below and above the hang hole preventing any leakage. We carry the largest stock of band sealers, but if you do not find what you are looking for, don’t fret as we can help you with custom options. Our expertise and customer service team are second to none. While in college, Kernel Season’s founder Brian made popcorn—night after night. It was fluffy, healthy and fast to make… but it always tasted the same. One evening, a thought popped into his head: there has to be a way to shake up the flavor of his favorite snack. Brian started creating fun and bold spice mixtures to toss into his popcorn. After college, Brian took Kernel Season’s to the next level by teaming up with experienced flavor experts to perfect his recipes. Kernel Season’s is now America’s number one brand of popcorn seasoning. It is available in over 15,000 stores nationwide including Walmart, Kroger, Target, and Safeway. Packaging World reports that San Francisco based company, KOOEE! uses Sealer Sales band sealer – FRS-1120W to seal their innovative “double-compartment” pouch pack. Our FRS-1120W is a free-standing band sealer capable of stamping a lot or expiration code on each bag for better traceability. KOOEE! Super Snacks uses 100% grass-fed beef, no added sugar, and no added hormones or anitbiotics. Products can be found at retailers such as The Fresh Market, Wegmans, Amazon and several independent health foods stores in the New York and SF Bay area. Sealer Sales, Inc is the preferred equipment provider for many food and industrial manufacturers. Our value-priced equipment is reliable and all equipment and spare parts are stocked out of our Northridge (Los Angeles), CA warehouse.